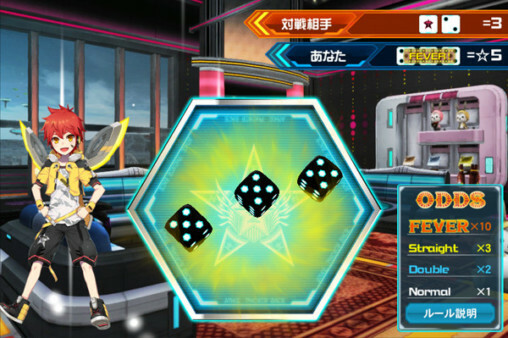 Photon Dice is a game where players must score higher than their opponent in order to win Leisure Coins. 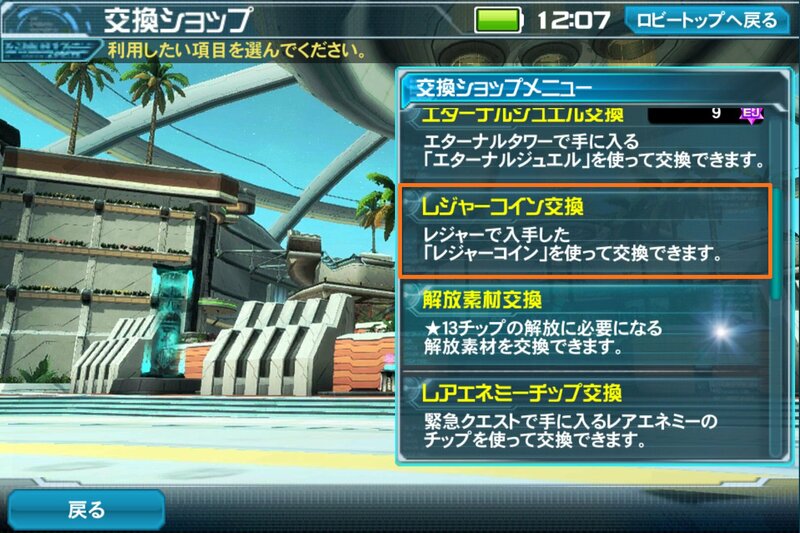 This new currency can be traded in at the exchange shop for special lobby actions and other prizes. Photon Dice can only be played up to a limited number of times per day. 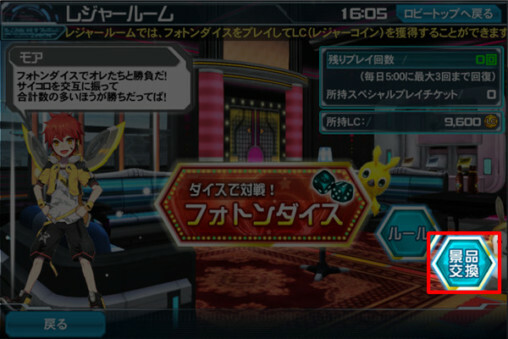 You can increase your number of chances by either waiting for the stamina to refill or acquiring items called スペシャルプレイチケット (Special Play Tickets). These can be acquired through various campaigns. The goal of the game is to roll dice with a higher value than your opponent. If you lose, you’ll forfeit the LC you’ve earned up to that point. The more consecutive wins, the more LC you’ll lose if you fail. Rolling three dice of the same value will activate a [Fever]. This will allow you to win the game regardless of the value your opponent. However, if both you and the opponent receive a Fever, then the dice of the higher value will determine the winner. 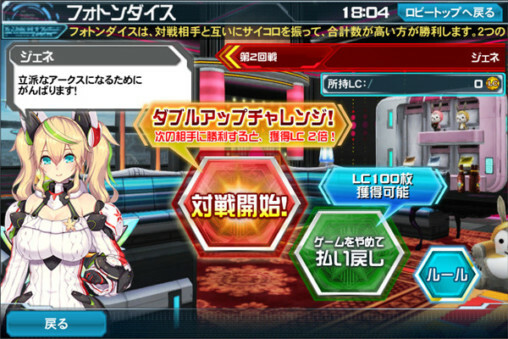 After the match, you’ll receive a new currency called Leisure Coins (LC). These can be traded in at the Prize Shop for various items. A [Double Up Challenge] can occur after winning the first playthrough. This increases the amount of LC you’ll earn if you win matches in a row. After 5 consecutive victories, the game will end, allowing you to claim the LC earned up to that point. 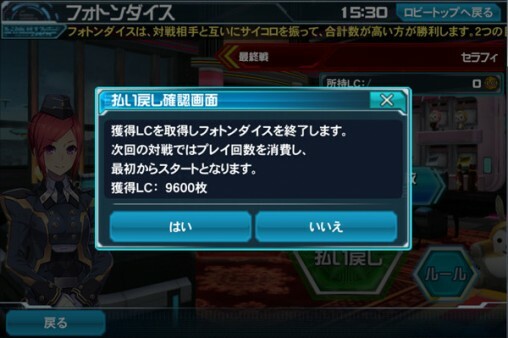 During Double Challenge, winning a normal match will double the amount of LC you can earn. 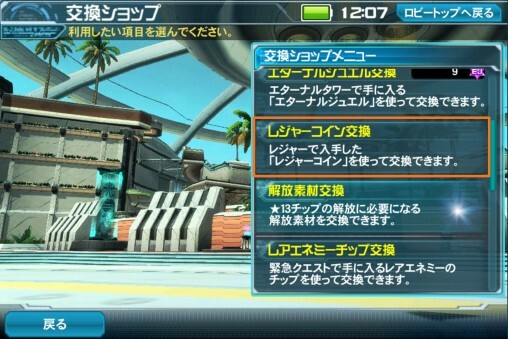 [Victory Bonuses] during Double Matches can also contribute an even higher LC. 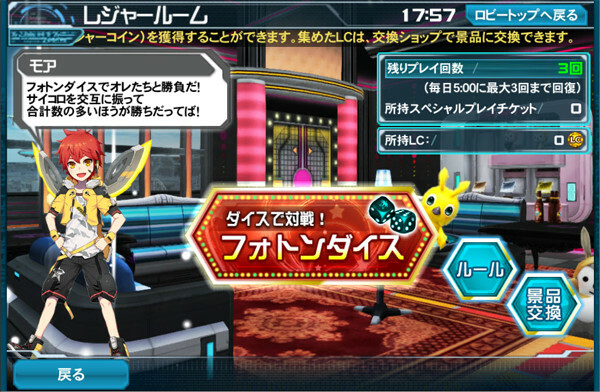 If you lose at any point during subsequent matches, you’ll lose all the Leisure Coins you’ve earned so far. However, by clicking this button, you can claim the coins you’ve earned through that play session. Press [はい] to receive your coins. Please keep in mind that any progress you made during the dice game will be reset to the beginning. Click the LC Exchange Shop tab at the top of the post. 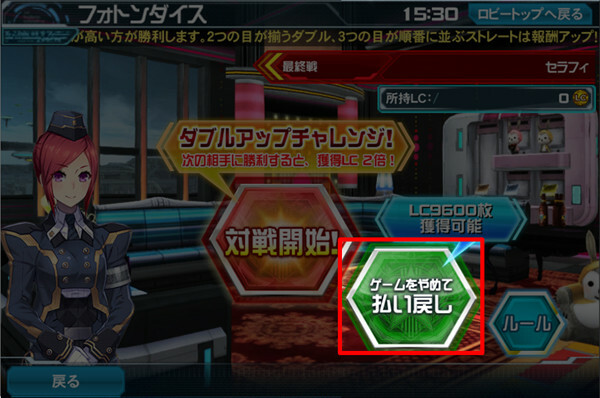 From the Exchange Shop menu, click on レシャーコイン交換 to open up the Exchange Shop. Not all items listed here may be in the Exchange Shop. It is your responsibility to check which items are available.